unable to upload any pictures from my phone to my blog.. initial troubleshooting efforts unsuccessful. some great pix when problem is resolved..
Congratulations to (me!). 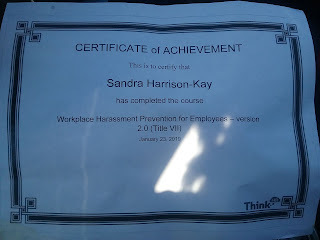 I passed the mandatory test given at work yesterday regarding preventing/addressing sexual harassment in the workplace. CH= many, but I will write of the main one that haunts me. It haunts me because I had a young beautiful girl turn specifically to me for help.. and I did nothing. what happen: -the beautiful young woman could not take a break, or have lunch without finding herself in the company of an older, married, male co-worker. it is true that he never said anything inappropriate. it is true that he never made any gesture, or tried to touch her -he did not make physical contact. if she had her lunch over there... there he was. if she went instead over there.. there he was..
if she changed the time... there he was.. I could go on and on about the nuances; everything that factored in..
coming up with a million excuses why I couldn't and didn't find the words.. I lost sleep some nights.. how can I say? if it doesn't go well.. to who can I turn? the young beautiful woman had quit and left the corporation. I never had a chance to apologize. she has expressed privately to me that she'd like to have lunch alone sometimes... it is her time to text on her phone, or read and relax.. she feels monopolized sometimes.. -if you could honor her space.."
why was that so hard? I can't explain... why so hard then; why so much easier now.. I bet the same is true for you..
but you turn to me... and I let you down. This is not a mistake I would ever let happen again. In Jesus name.. amen & amen.